Peter Quill (Chris Pratt) is reunited at long last with his father, a mysterious and powerful alien named Ego (Kurt Russell). While he acquaints himself with his father, Gamora (Zoe Saldana) and Drax (Dave Bautista) discover Ego is not telling Peter the whole truth. Meanwhile Rocket (Bradley Cooper) and Baby Groot (Vin Diesel) get caught up in a mutiny among Yondu (Michael Rooker) and his Ravager crew. In 2014 Guardians of the Galaxy felt like a welcome breath of fresh air for the Marvel Cinematic Universe: largely separated from the intertwined Avengers franchises, strikingly colourful in its aesthetic, and much more overtly comedic than any of the previous Marvel Studios films. This 2017 sequel retains much of what made the original film so refreshing and enjoyable, but also highlights some of the bigger problems that are affecting most of Marvel’s feature output. One thing at which Marvel has always excelled is casting. The entire returning cast is on top form in this sequel, delivering constant laugh-out-loud comedy and strong, sympathetic moments when the story turns dramatic. There is a wonderfully strong sense of chemistry among the entire cast – no small feat when you consider two of them are delivering their vocal performances in a recording booth months after the life action components have been shot. Dave Bautista’s comedy skills feel particularly strong this time around, whereas Michael Rooker – an underrated actor if ever Hollywood had one – makes the most of an increasing presence and all but steals the whole movie. As Ego, Kurt Russell is amiable and hugely watchable, but he honest does not have a great deal of material with which to work; the film’s treatment of his character is fairly superficial. The film’s action varies from the great to the average. A mid-film sequence that sees Yondu, Rocket and Groot take over a Ravager starship is beautifully staged and impressively shot, and is far and away the stand-out scene of the entire movie. On the other hand the film’s climax becomes visually rather messy, and includes one of my least favourite Summer blockbuster trends: the climax where two visual effects have a fist-fight. The design work remains excellent, with a positively gleeful use of colour that – going by the trailers to Marvel’s forthcoming Thor: Ragnarok – is having a contagious effect on the studio. 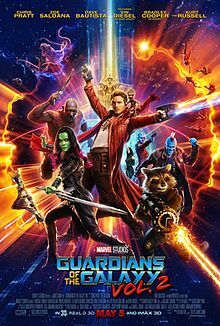 Add that to the strong cast, plenty of well-directed jokes, action scenes that work more often than they don’t, and pleasingly nostalgic soundtrack, and Guardians of the Galaxy Vol 2 is altogether very entertaining. Its only significant drawback is the story. This is a problem that seems to be affecting the majority of Marvel Studios features. Much of what works in Guardians has been working in all of their films: they look good, they’re enjoyable to watch, and their casting really is unparalleled among studio tentpoles. Few of them have particularly strong or inventive plots. Guardians of the Galaxy Vol 2 is a pretty representative example. When you write it down, very little actually happens in this film’s 135 minutes. What does happen lacks much in the way of surprises or urgency. It does not cripple the film, because the other elements more than compensate, but the weak storytelling is what separates many of these Marvel films from being fun movies and being genuinely excellent films. One wonders if the studio is being risk-averse: making a film starring a taking raccoon and a walking tree might already be stretching a mass audience’s credulity, and throwing in a complex narrative might kill its commercial potential. A same thought process seems to have affected Scott Derrickson’s Doctor Strange, which similarly combined stunning visuals with a weak story. If this is the case I think Marvel should be trusting its audience a little more. Imperfect but enjoyable, Guardians of the Galaxy Vol 2 is an entertaining blockbuster in a year that has seemed full of mostly entertaining but flawed studio fare. Next time around – and the closing titles promise there will be a next time – I hope that James Gunn and Marvel Studios attempt to tell something just a little more ambitious and complicated. The audience can take it; hell, I suspect many more viewers than myself would positively welcome it.